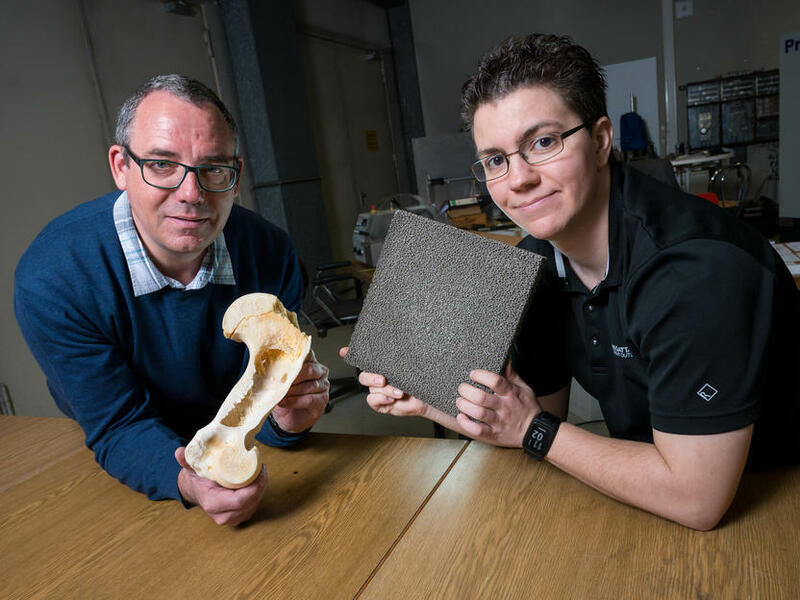 Taking inspiration from bones: Materials scientists Stefan Diebels (l.) and Anne Jung can customize their lightweight and strong metal foams for a wide range of applications. Strong enough not only for use in impact protection systems in cars, but able to absorb the shock waves produced by a detonation. Those are just some of the properties shown by the metallic foams developed by materials scientists Stefan Diebels and Anne Jung at Saarland University. Their super lightweight and extremely strong metal foams can be customized for a wide range of applications. The inspiration for the new foam system came from nature: bones. 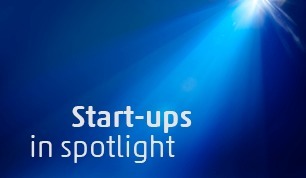 Using a patented coating process, the Saarbrücken team is able to manufacture highly stable, porous metallic foams that can be used, for example, in lightweight construction projects. The initial lattice substrate is either an aluminium or polymer foam, not dissimilar to a kitchen sponge. Bones are one of nature’s many ingenious developments. They are strong and stable and can cope with loads almost as well as steel. But despite their strength, they are light enough to be easily moved by humans and animals. The secret lies in the combination of a hard exterior shell that encases a porous lattice-like network of bone tissue in the interior of the bone. This structure saves on material and reduces weight. 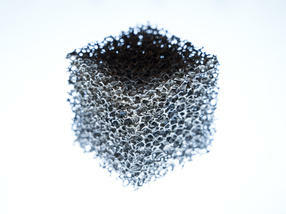 Metal foams are able to mimic these naturally occurring bone structures. The synthetic foams are porous, open-cell structures that are manufactured from metals and that have the appearance of a sponge. The metal foams currently available are certainly lightweight, but the production process is both complicated and expensive. And the stability of the sponge-like foam structure is still too weak and not resilient enough for many applications. This is certainly true of aluminium foam, which is the most common type produced today. ‘This is the reason why metal foams have so far not had any real market impact,’ explains materials scientist Stefan Diebels, Professor of Applied Mechanics at Saarland University. His research team has found a way to significantly strengthen the lattice structure of the metal foams, producing a lightweight, extremely stable and versatile material. Diebels and materials scientist Dr. Anne Jung have developed a patented procedure for coating the individual struts that make up the open-cell interior lattice. As a result, the exterior of the foam is stronger and more stable and the structure is now able to withstand extreme loads. However, the treated foam remains amazingly light. The team started out using aluminium foams but are now using inexpensive polyurethane foams whose strength comes entirely from the thin metal coating applied to the lattice structure. ‘The resulting metal foams have a low density, a large surface area but a small volume. In relation to their weight, these foams are extremely strong and rigid,’ says Stefan Diebels. In fact, they are so strong that they are being used as mobile barriers to provide protection from the shock waves caused by explosions. Even when exposed to underwater detonations, the foams simply ‘swallow’ the resulting sound and pressure waves, thus protecting sensitive marine organisms from the effects of these powerful shock waves. ‘Most of the applications we focus on are generally less spectacular, such as the use of our foams in lightweight construction,’ explains Dr. Anne Jung, a senior research scientist in Diebels’ group. Dr. Jung actually completed two doctoral theses. She was awarded the German Thesis Award from the Körber Foundation for ‘the most important dissertation of the year with significant relevance for society’ for her first doctoral theses on the subject of metal foams. Many products can be made lighter and more stable by drawing inspiration from nature’s design ingenuity. For example, load-bearing structures in cars and aeroplanes could be manufactured from the metal foam. ‘They can be installed as reinforcing struts in the bodywork, while also providing impact protection. The struts can take up large amounts of energy and are able to absorb the force of a collision when parts of the porous core fracture under impact,’ explains Anne Jung. There are numerous areas of application for these foams, such as in catalysis, as the material is porous and thus allows liquids and gases to flow through it, or for shock absorption or as a heat shield, as the foams exhibit excellent heat resistance. The foam material can also be used for electromagnetic screening or in architectural applications, where it finds use as sound-absorbing cladding or as a building design element. The coating is applied in an electroplating bath. The most challenging aspect of the electroplating process was achieving a uniform coating of the ultrathin layer throughout the entire interior of the foam structure. ‘The problem’, explains Anne Jung, ‘is that the metallic foam acts as a Faraday cage.’ As the interior of the foam is surrounded by electrically conducting material, electric current and thus the coating is diverted to the exterior of the foam body and does not travel through the interior of the foam – it’s similar to what happens when lightning strikes a car. 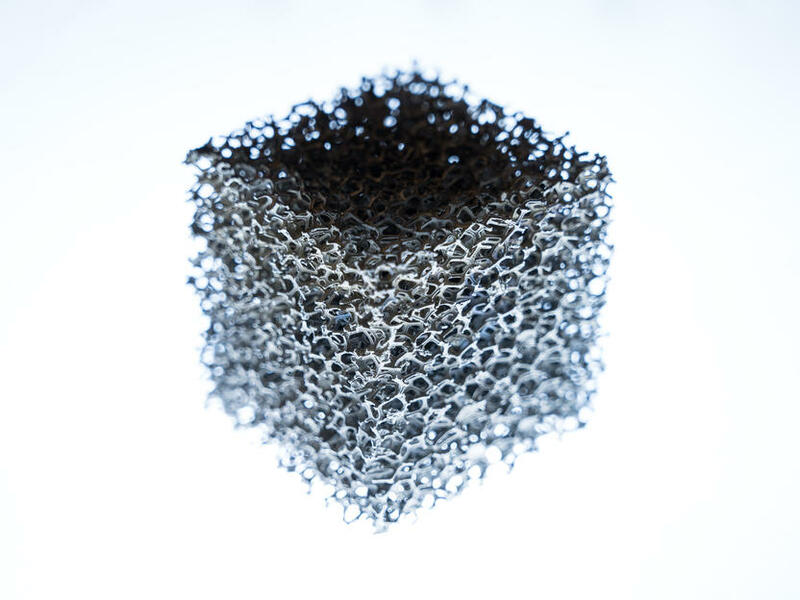 The breakthrough came when Anne Jung decided to use a special anode cage, which allows her to apply a uniform, nanocrystalline coating throughout the entire lattice network. ‘The patented method also functions on the industrial scale with foams with very large surface areas,’ adds Jung. The Saarbrücken team has authored numerous important scientific papers in the field and is now regarded as one of the world’s leading research groups in the micromechanical characterization of these porous metal lattices. Using an array of experiments, simulations, tension and compression testing, optical microscopy and x-ray computed tomography, the research team have examined the structure, pore geometry and curvature of the struts and have shown how varying the thickness of the nanocoating can impart different properties to the foam materials. By varying the composition of the coating, its thickness or the pore size, the team is able to customize foams to meet different application needs. For example, nanocoating the open-cell lattice structure with nickel produces particularly strong foams, with copper the foam material exhibits high thermal conductivity, with silver they have good antibacterial properties, and with gold the foam is highly decorative. The Saarbrücken research group, which includes students and doctoral researchers, are continuing to work on optimizing both the production process and the material itself. The research team and the start-up company that their work has spawned (Mac Panther Materials GmbH, Bremen, Germany) will be at Hannover Messe where they will be showcasing their process from the 1st to the 5th of April at the Saarland Research and Innovation Stand (Hall 2, Stand B46).